For many travellers, the seat is the most important part of their flying experience, but what can truly separate the different airline cabins is not their seats but rather their food. When you fly in First Class your dining experience is taken to a level you likely have never experienced before in the sky, or even on ground. 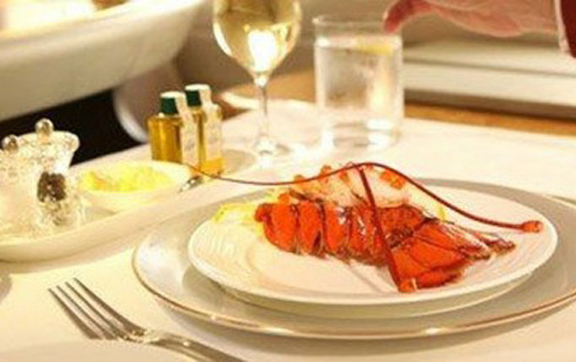 Below are a selection of the world’s best First Class airline dining experiences that you can enjoy flying out of Australia. When you fly in the Etihad First Class Apartment you will be welcomed on board with a traditional Arabic coffee and dates as well as a refreshment of your choice. From there you will be provided with a choice of cuisine inspired by the world’s leading fine dining restaurants and made with only the freshest ingredients. Or, allow your Inflight Chef to take charge and present you with a unique dining experience at 35,000 ft as they invent a seven-course tasting menu to suit your preferences. Prepare to indulge on fennel Panna Cotta with candied cumquats, traditional Arabic mezze plates and black current sorbets just as starters. Then for dinner you might enjoy the special – such as a summer steak salad followed by a chocolate hazelnut tart for dessert. If you’re feeling peckish you might even order from the Mezoon Grille menu (exclusive to First Class customers) a perfectly cooked tenderloin steak and chips – freshly made by your Inflight Chef of course. To pair with your exceptional dining experience is a boutique wine list with beverages hand picked from the world’s best vineyards as well as a signature Cognac service. Throughout your flight you can also enjoy refreshments at your leisure with a personal, fully-stocked drinks cabinet. There is a reason that Eithad Airways was awarded Best First Class Catering at the 2016 Skytrax awards, where else will you find such personalised culinary service whilst in the air? Alongside its fellow UAE airline, Emirates has striven to offer one of the best First Class dining experiences in the world. 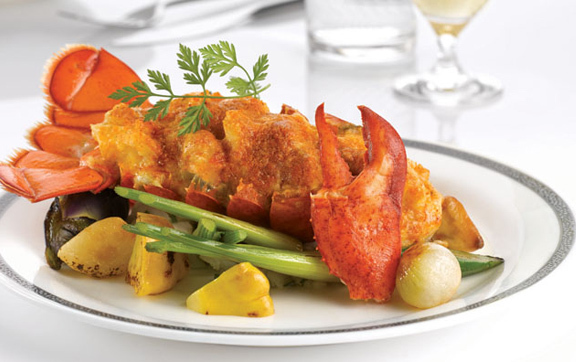 Emirates strives to reflect its destinations, on the Brisbane-to-Singpaore route for example you might enjoy Asian-accented braised beef rib or fresh, stir-fried lobster in black bean sauce. On demand dining means that passengers might order multi-course meals and snacks from the extensive menu at any time, whilst enjoying a complete range of complimentary drinks including cocktails, champagne and vintage wines. On one flight you might enjoy wild Iranian caviar followed by a fillet of salmon on a bed of seasonal salad and a finale of chocolate panacotta with almond brittle. Or perhaps an Asia-inspired shrimp appetizer before a buttery pumpkin soup and slow cooked beef and mash potatoes. The options truly are endless when you dine in Emirates First Class. Singapore Airlines inflight menu is curated by an international culinary panel made up of acclaimed chefs from around the world. To match these world-class origins, all food is served with restaurant-service in mind, presented on bone china by Wedgewood. Singapore Airlines also offers you the opportunity to ‘book the cook’ and reserve your main course up to 24 hours before you fly as well as wines to match the food as well as the altitude. Singapore Airlines is the only airline to offer both Krug Grand Cuvee and Dom Perignon 2004 – with caviar, and that’s before the plane has even taken off. Excellence abounds throughout the dining experience. A ‘light meal’ in Singapore Airlines First Class Suites involves three courses with options such as a Timabale of marinated crayfish, asparagus and caviar with a tomato consomme; oriental lobster and ginger spring onion with flower mushrooms, greens and fried rice; completed with a frangipane tart with a dome of vanilla Bavarian cream, fig and coffee sauce. 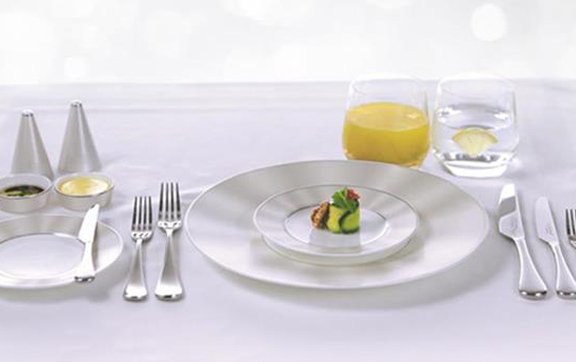 Singapore Airlines pulls out all the stops, no matter what the meal time. Qantas has paired with Rockpool to take inflight dining to new heights in First Class. You can choose to indulge in an eight-course degustation or dine a la carte with signature dishes – all prepared fresh on board, made to order and designed by acclaimed Australian chef, Neil Perry. 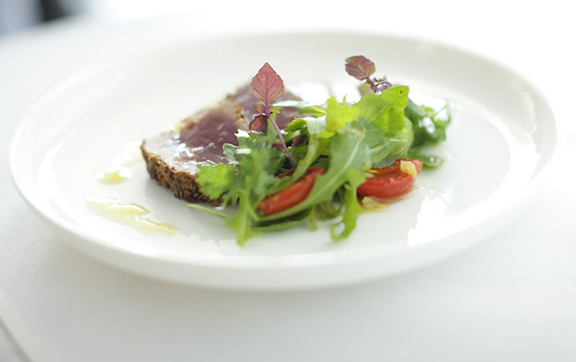 Meal options include beef carpaccio with marinated mushrooms, parslet and marigiano reggiano; Qantas’ signature steak sandwich with tomato and chilli relish; seared snapper with shaved fennel, snow peas, lemon and olive oil; and chocolate almond cake with roagne salad and orange blossom cream. If you’re wondering what refreshments to pair with your meal you can consult on of Qantas’ Sommeliers in the Sky who can advise you on the selection of award-winning wine and champagne to match your meal. Snacks and light meals are also available at any time during your flight. When it comes to showing off the best of Australian food and wine, Qantas has no competitor.